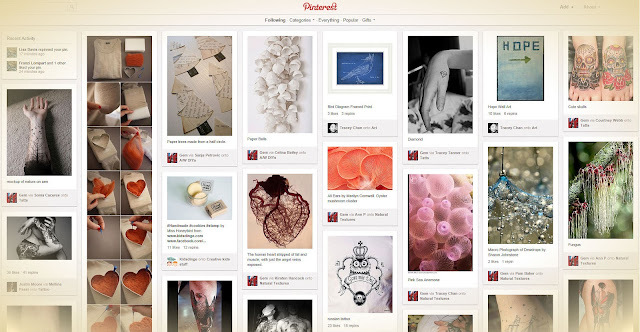 I have joined Pinterest and it's Awesome! Why didn't I do this earlier?...probably because I didn't know how to use it, like twitter. Meep. Very late on these technological bandwagons, but it's really really cool. You can make virtual pin boards of your favourite things. If you haven't already, you should join so we can look at pretty pictures and stuff. Flatforms - Love or hate? Flatforms...I loathed them at first. So not a fan. They look like a brick has just been lashed on the bottom, and something my gran would wear. However, I've found that I've grown to love them. So now I'm asking myself why? If they weren't on the catwalks, fashion shows, adverts, magazines, and generally being shoved down my throat everywhere I looked/shopped, would I still like them? Anyway, I'm loving the whole spike, studded, grunge trend. Bring on the messy, dirty textured hair, with last nights panda eye make up, and oversized, slouchy jumpers. I can almost smell the teen spirit. So when I saw these, I had to have them. I picked up these little beauties for my late jolly holidays in October. I figured that these were a good inbetweener shoe, so I can feel a bit dressy and not be so vertically challenged. Also, they're comfy, and I didn't have to part with too many hard earned pennies! :] Got to love Ebay! Yes it looks a bit like wee and I can’t say I love the taste, but it has amazing health/beauty benefits. Obviously it’s a million times better for you than fizzy drinks/soda/pop, but also much better than your morning cup of Joe and regular tea with milk, (hold the sugar thanks) and it still has the much needed caffeine that most of us seem to run on these days. I drink 3+ big buckets cups a day, but like I said I’m not a big fan of the taste so I have green tea with lemon :] (Clipper if your interested) You can also buy it with jasmine, pineapple, cranberry and a tonne of other flowers and fruitiness, which I find make it more palatable. Depends on what you like really. Antioxidants - These are super important as they protect your cells against the effects of free radicals. Free radicals are produced when your body breaks down food, or when you’re exposed to rubbish environments like smoke from sticks of death, pollution, radiation - what if Peter Parker or Bruce Banner had drank green tea...This isn’t aiding my discussion is it? So anyway these free radicals hurt your little cells, and can be responsible for heart disease, cancer and other bad stuff. Theanine or L-theanine - An amino acid that is found naturally in green tea, associated with relaxation, which can counter act the caffeine. So with all the above, green tea can reduces the risk of: heart disease, kidney disease, cancer, blood clots, high blood pressure, heart attacks and osteoporosis. Generally boosting your immune system making you less likely to get the sniffles or man flu, or if your a student it reduces the risk of freshers flu.You can find more in depth sciencey stuff if you google green tea, some say it's good for weight loss and speeding up metabolism. There you have it, green tea is like a magic potion for your insides, exterminating lots of free radicals and other junk zooming around. When your insides are happy, it shows on the outside! Find me a girl who isn't distracted by something shiny, It's the way we are made. Whether its diamonds, glossy nail varnish or a gleaming kitchen surface ( Stereotype much ) a glazed doughnut, it's bound to make the majority of ladies pause and say 'ooooh'! As the picture shows, I think they turned out okay :] almost worthy of a big fat gypsy wedding. I’ve done a video of the ‘How To’ and popped the link below, so if you have the time to check it out, please do. Hello, my name is Gem and I’m a lip balm addict. But why can I never find one when I need one? Where do they go? How do they come back? Is it just me? Why is this even a problem? I refuse to buy any more, now that I’ve taken the time to find them. I’ll lock them up (although that aloe vera looks like it’s already served some time) and redistribute a select few, maybe pop an extra one in my handbag for luck. However, I can guarantee later, I’ll reach into my bag, in need of some balm, yet I will not for the life of me be able to find a single one. I thought I’d do a post about what make up I like to use on a daily basis, it seemed like a good place to start. These are all high street /drugstore products that I’m currently making my way through. I don’t know about anyone else, but I tend to get bored with products and throw them back in my draw in disgust, only to rediscover them a few weeks/months later, and find myself loving them all over again...for a week. Fickle. Poor make up. This is why I mostly have high street stuff, I don’t feel as bad if it goes off before I use it all! Any high end brand products that I own, I’ve normal research to death so I make sure I’m not wasting my pennies. This bronzer is perfect for bringing me back from the dead (I'm fairly pale) and it doesn't have that orange tint that some others do. Plus I find it great for contouring as there’s little to no shimmer. Overall, amazing product for the price and the Limited Collection range is actually great! I've got an eye shadow (featured) and blusher too which I also love. The texture of this foundation is beautiful; it really is like your own skin but better. I'd say it was a light but buildable coverage, which I prefer. Currently this shade is a little too warm for me, but if I buff it in well and take it down the neck it's unnoticeable. I find that it does perk my skin up, and lasts fairly well, but I'd recommend a primer underneath for longer wear. The colour pay off with these blushes is pretty awesome, and although it's a bit of a bright and scary pink, it translates onto the cheeks lovely creating a nice flush. They're nice and travel friendly, plus the packaging is pretty, very Nars. It's super natural because it's cream to powder. I love it. The only downside is that it goes on bright, but then the colour fades, so you need to apply it twice to get the first colour! It sits fine on top of powder too, and I think I prefer this over the sleek blush because its creamy, and feels nice on the skin. I have super oily eyelids, so a primer is a must for me on a daily basis if I'm venturing out into the public. I was very sceptical about this product, having tried other high street cream eye shadows that just creased, melted down my face (attractive) or simply disappeared into thin air. However, this is pretty good. I can't vouch for the 24hr thing, as that's just pretty gross tbh, but I can say that it lasts for a working day. I just sweep it across my lids with my fingertip, quite sheer, and then set it with a similar glittery eyes shadow and I'm good to go. It really makes me look awake too! Always a plus. Ok, so this is blatantly not 'copper' I'd say more fawn/light grey brown. Either way, this is my perfect brow shade! Hurrah! With very little fall out and good pigmentation, which makes it perfect for subtly lining my lower lash line too. Perfect. Right, so as previously noted I have oily lids, which can result in panda-ness with some mascara, which is why I always opt for waterproof with high street stuff. Also, I'm not a fan of clumpy lashes; you know when it looks like you only have 3 fat lashes on your whole lid. Not cool. This causes neither of these things, so yay! I can't say I've noticed my lashes growing with this, but it does have a nice natural effect on my eyes. It fills my eyelashes out and is the 'blackest black'. I didn't pay£10 for it, and I don't think I ever would when there’s equally good products for less, but it is a nice mascara. No7 is only available in Boots, and I bought this when they had the £5 off vouchers they consistently give out, so it was £7.95 instead. This is my go to eye brightener, it's my perfect shade and blends in lovely - I suggest fingertips. I've tried the Clinique and Bourjois versions, but this No7 is my favourite. Not much else to say, it's awesome. So after reading beauty and fashion related blogs, and watching similar things on you tube, I have decided to jump on the bandwagon.